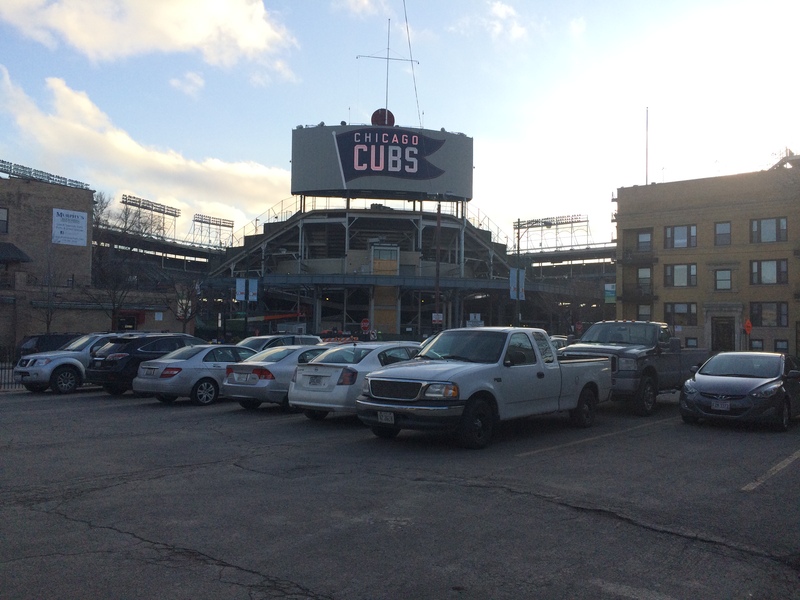 The Parking Game: There’s Lots of Competition in Wrigleyville. Lots and Lots. To check the pulse of the Chicago Cubs during any given season, you can take in a game at Wrigley Field or follow the team on television, through the box scores, or in the standings. You can glance up at the flag flying above the center field scoreboard as you pass by on the train, white for a victory that day, blue for a loss. Or, a less obvious yet still effective method, you can simply go by what the lots around the stadium, most of which are owned independently of the team, are charging for a place to park during a game. Unlike at U.S. Cellular Field, the United Center and Toyota Park, where Chicago’s other professional sports teams play, no great sea of parking space exists outside Wrigley Field; instead, it is more like a cluster of small ponds. One-hundred years old last April, Wrigley is famously situated in the middle of a residential neighborhood. One moment you are walking north on tree-lined Sheffield Avenue past a row of three-flats, then all of a sudden there it is—an overwhelming burst of concrete and steel dwarfing you and everything in its shadow: a 40,000-plus-capacity baseball stadium. At the time Wrigley was built, its location, a few steps from the El and within bustling turn-of-the-century Lakeview, made it ideal, Margaret Gripshover notes in her essay, “Lake View, Baseball, and Wrigleyville: The History of a Chicago Neighborhood.” Most fans back then would have traveled to the game on foot or by train. 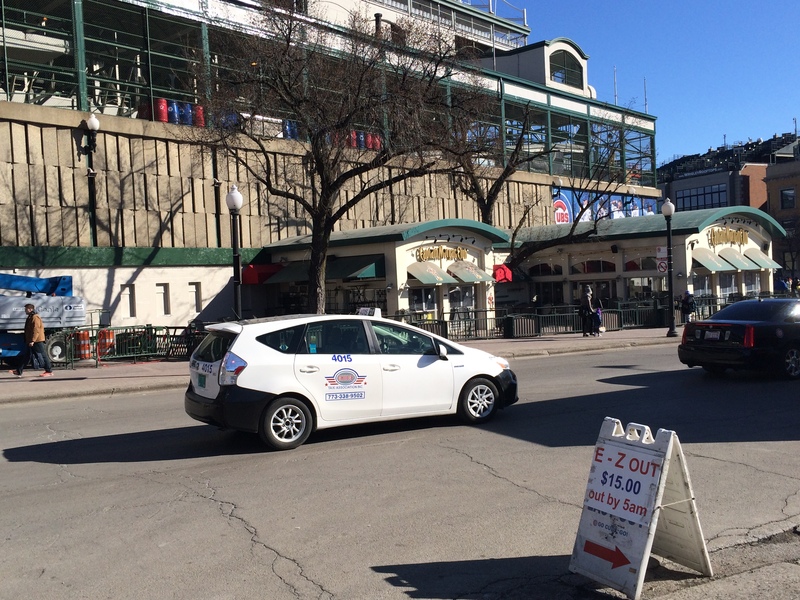 Wrigley Field is so old that only after automobiles became prevalent did its location become problematic. To say nothing of today, back in the early fifties the ward’s alderman cited parking and congestion as the main problems in the area, with the area around Wrigley, later to be known as Wrigleyville, being the worst. Any chunk of space could help ease the parking burden. A convent that once stood on the 1100 block of West Grace, a few blocks north of the stadium, allowed Cubs fans to park there on game days for a donation (though the operation later came under investigation, the Sisters having since contracted out to a private firm, for parking without a license). With extremely limited official team parking, out of this need for space did arise the familiar EZ Outs, the gas station and liquor store lots doubling as Cubs parking on game days and the residential garages run by self-proclaimed “alley entrepreneurs,” accessed through the alleys and available to fans for a fee. The parking scene down at Wrigley has become as much a part of the neighborhood fabric as baseball bar institutions Murphy’s Bleachers and Sluggers. Some of the lots have been in families for fifty years or more. And in these lots you will hear conversations on pension reform, the Chicago Teachers Union, and Rahm Emanuel, though ultimately it all comes back to the Cubs and how whatever it is they are doing, or in some cases not doing, is affecting the prices lot owners can command that season. Pricing strategies for each game must take into account a range of shifting circumstances, including temperature, day of the week, yesterday’s outcome, today’s opponent, if there is a desirable giveaway at the gate. Most importantly, however, pricing depends on how the team is playing that season. 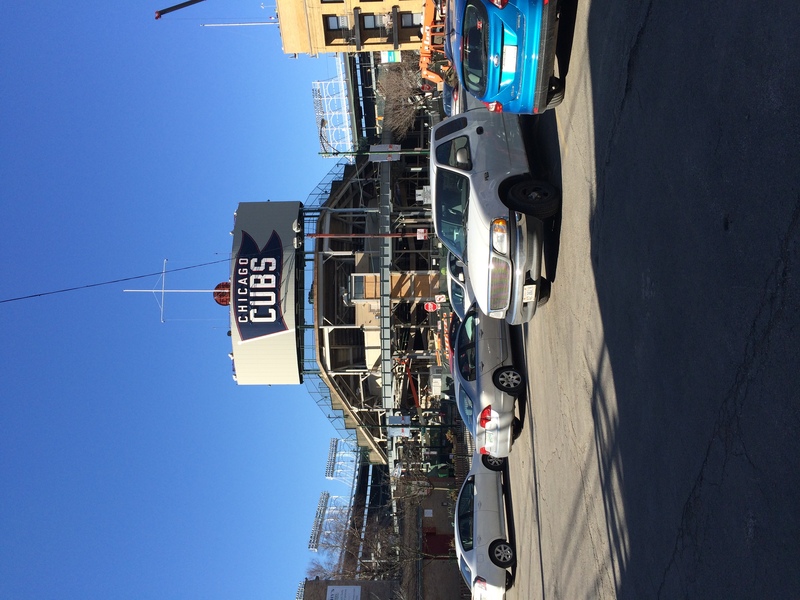 Last summer I spent some time in the lots, with the Cubs sitting comfortably in last place. It was two months before what the team has called “one of the most important off-seasons in its history,” with many changes set to begin taking place for the Cubs and Wrigley Field after the final out of the season. The first stop I made was at the 1000 block of Newport Avenue. 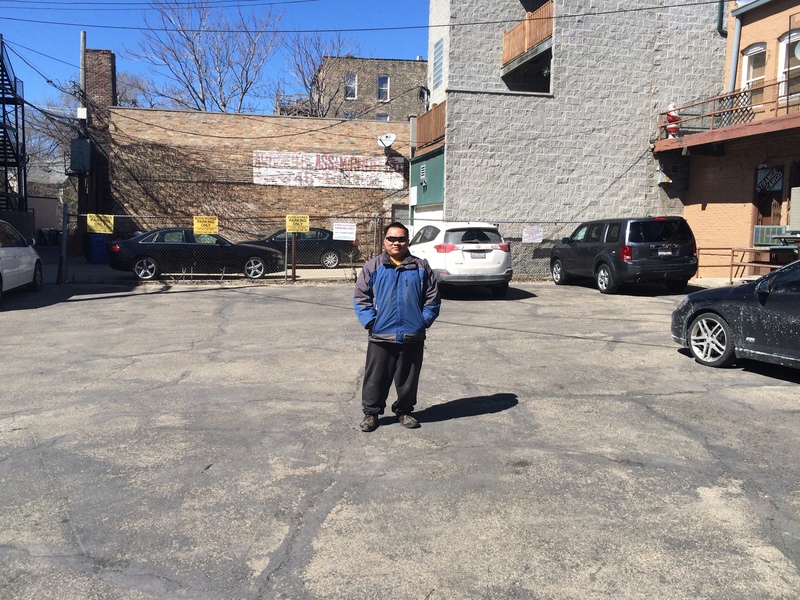 There I visited with Ron Mendoza, who owns both the lot and the building bordering it to the east. The building, which faces Clark Street, is occupied by several businesses, one of which, Bookworks, in a rarity for the area has nothing to do with sports or the sale of alcohol. Mendoza has been parking cars at this lot since the late seventies. He was here back when the neighborhood was run down and inhabited by the Latin Eagles and the Latin Kings. He has been here so long, in fact, he is now parking the grandkids of regular customers he knew when they were single. His “regulars,” as loyal to him as they are to their frustrating baseball team, bring him six-packs of beer, chocolate from Hawaii, even a game ticket on occasion as a joke; a lifelong Cubs fan, Mendoza hasn’t been to a game at Wrigley since 1984: if he’s at the game, who’s watching your car? Of the fifteen spaces in his lot, seven were empty with thirty minutes till first pitch. Mendoza pointed out he has more regular customers than spaces, and if they decided to come down for a game on the same day he couldn’t park them all. On this day only two of his regulars had called ahead for a spot. Pricing was set at thirty dollars, which is what he tried to get for games that should have high demand. All things considered, this game should have had, if not high, then at least some demand. It was a Sunday afternoon, and though the Cubs had lost the day before, the St. Louis Cardinals are their most hated National League rival, making for an always interesting matchup. Temperatures were in the eighties, and there was a giveaway at the park—a seventies throwback magic baseball; not a great one, but a giveaway nonetheless. Several cars had slowed up on the street, with drivers asking about the price, whether it might be lower for a compact vehicle (in some lots this is the case), but it was still early enough that Mendoza wouldn’t budge. The drivers moved on. Later I watched as a man pulled up through the alley. Mendoza approached his car and asked if he was going to the game. The man replied he was only looking to sell some books to Bookworks. Mendoza allowed him one of the unoccupied spaces in the lot. After the game had started and there were still four spaces to fill, Mendoza lowered the price to twenty dollars. On the surface, everything with the Cubs can seem copacetic: this past week Forbes ranked them as the fifth most valuable team in Major League Baseball, worth $1.8 billion. On the strength of Wrigley Field’s historic appeal and the neighborhood’s “Hall Pass” climate, the Cubs posted strong attendance figures again last season, bringing in not only baseball fans, but both tourists from all over the world and locals merely looking for a good time. Last year the Cubs sold more than 2.6 million tickets despite finishing last in their division—a feat that ownership in a city such as Tampa, who drew over a million fewer fans in 2014 despite having made the playoffs three of the prior four seasons, might file under #cubsproblems. “What did Jesus say to the Cubs? The resale price of tickets for Cubs games last summer, another good measure of the popularity of a franchise with its fanbase, was often around half of face value. On StubHub, the fan-to-fan ticket website, six dollars would get you into Wrigley Field for a midweek game last September. A bag of peanuts inside costs just about as much. In an effort to combat these trends—according to the team by “creating every advantage possible to innovate, operate efficiently and grow its business faster than the other 29 clubs trying to compete for a World Series trophy each year”—Cubs ownership, led by chairman Tom Ricketts, in 2013 proposed a privately funded $575 million dollar stadium and neighborhood restoration plan, now known as the 1060 Project. Some elements of the plan were welcomed, including nearly tripling the size of the Cubs’ clubhouse, improving strength and conditioning facilities, and adding underground batting tunnels where hitters can see live pitching before they enter a game; in short, allowing Cubs players, for so long deprived of certain amenities because of the age of their ballpark, to work in conditions similar to those of the other twenty-nine teams in Major League Baseball. Where the proposal has earned its detractors comes from aspects of the plan that won’t directly affect the team, particularly a 175-room hotel on the west side of Clark Street, across from the stadium, and some very not-cosmetic videoboards and advertising signs that would obstruct sightlines into the stadium from the Sheffield and Waveland rooftops, many of which are currently in the midst of a twenty-year revenue-sharing agreement with the team. Though the team’s proposals have made it through the approval process—signed off on by the City Council, the Plan Commission, and also the Landmarks Commission (required for changes to the park since Wrigley gained city landmark status in 2004)—two rooftop owners have since sued the team, trying to block installation of the signage that they contend will leave their businesses broke. The lawsuit is currently pending in federal court. Along with rooftop owners, many neighborhood groups and residents have opposed aspects of the plan. Some critics charge that the Ricketts family, who own the Chicago Cubs, want to buy up the entire neighborhood with the intent to create a Cubs empire. The Ricketts’ acquisition of three rooftop properties outside the stadium in recent months does nothing to dispel this accusation. An article on DNAinfo—a publication also owned by the Ricketts family—cited resident concerns of a “Las Vegas atmosphere” overtaking what some would already consider just that. Mendoza, who lives in the Wrigleyville area, disagreed with these stances. Mendoza then referenced a comment made by Tom Ricketts, in 2013, about a possible Cubs relocation to the suburbs if the team’s restoration plans were not met with approval. Mendoza did not believe it to be an idle threat. This past offseason, Phase I of the 1060 Project’s four phase restoration plan began, and thus it is clear the Cubs aren’t going anywhere (all work is expected to be completed by 2018). One aspect of Phase I is the expansion of the Budweiser Bleachers. Work crews and construction machinery have occupied Sheffield and Waveland Avenues since the end of last season, with as many as three months of labor left to go. Progress has been delayed first due to sewer work beneath Sheffield, then because of extremely cold temperatures in January and February. None too reassuring for area residents, Crane Kenney, president of business operations for the Cubs, commented to the press that the Cubs “were hopeful for a warm winter.” Just recently the Cubs requested an exemption to continue working twenty-four hours a day, seven days a week, to speed up the completion time, but were denied by the city. The bleachers will not be open for the start of the 2015 season. Back in Mendoza’s lot on that late July day, the day had gotten much later for the Cubs. The game was now in the sixth inning, and they were losing 1-0, thanks to a Cardinals slugger Matt Holliday home run. Mendoza, on the other hand, had finally sold his last space—for fifteen dollars, to a group of young men not even going to the game but in town, from Michigan, to visit a friend in Lakeview. And with the lot now full I got ready to leave, though not before I heard on the radio the announced attendance for this game was over 35,000. This conflicted with an earlier account of one passing fan who had attended the game and then left midway through: a Cubs fan perhaps to a fault, he said the stadium that day had looked half empty. With space for about forty cars, Ivy carried a clipboard that allowed her to better see and keep track of the vehicular geometry in her lot. In addition to the expanded real estate versus Mendoza’s, when demand called for it she would block cars in so as to fit more. Tonight would not be one of those nights. It was the day after my visit to Mendoza’s lot. The Cubs were to take on the hapless Colorado Rockies, last-place contenders for their own division, and there was no fun giveaway at the gate—it was a Northwestern University athletics schedule. Ivy had set her price at fifteen dollars. I asked about the Cubs’ controversial Wrigley and neighborhood plans, to which she seemed mostly favorable. I noted one aspect of the plan was, in an effort to ease area congestion, to provide more parking options for fans, including seventy-five new spaces located beneath the proposed hotel (though most of those spaces would presumably go to the hotel’s guests). She had no problem with increased parking options, believing that if you supply more spaces, more people will come. Fans attending from the northern suburbs, they want to drive to games, and she thought it’s not so much that fans aren’t going to the games, or that there are too many parking spots for not enough cars, but that people have been scared off from driving down to the area because of traffic and parking horror stories—ghost stories at this point, no doubt, left over from a few years back when the team was drawing three-million-plus each season, with that number actually showing up. Less than an hour till game time, Ivy had filled fifteen spots. A white van approached on Roscoe and Ivy told the driver it’d be twenty-five dollars. 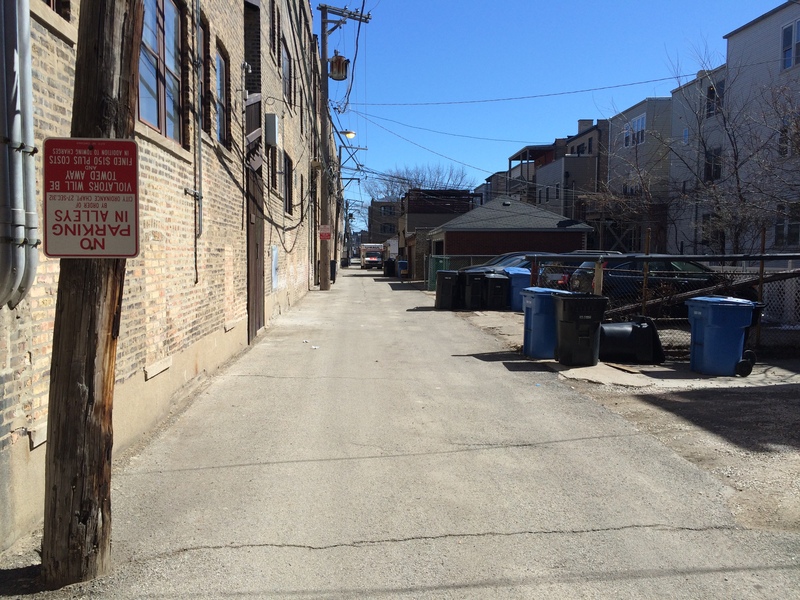 The license comment was in reference to “alley entrepreneurs,” or Wrigleyville residents who provide to Cubs fans driving into their garage or parking space, which back up into alleys, for a fee. Ivy viewed them as direct competitors (whereas Mendoza didn’t think they have enough spots for it to matter much). She said because the alley entrepreneurs do not go through the same regulatory process as lot owners, who are required to obtain a license, the practice is unfair. She brought up how new parking apps, such as SpotHero and ParkWhiz, which allow users to wirelessly search and reserve available parking spots posted in a designated area, have made it easier for drivers to locate these alley spots. A few weeks later I spent part of one Sunday morning, before a game against the Tampa Bay Rays, with an alley entrepreneur named Tommy. He owns a building on an alley just down from Wrigley off of Addison. He has parked the alley for years—and his father had been out here parking before that, back in the sixties. How this worked was all the residences lining the alley let Tommy know before the season if they were going to allow fan parking in their space. Tommy then would text those participating before each Cubs homestand to find out the exact dates they would make their space available. There were open-air spots and “closed” spots, or the ones in garages; there were also two spot categories: those where you were expected to leave right after the game, and those that are called “late spots,” in which you could leave your car for a few hours after to take in some Wrigleyville nightlife (those are often more expensive). That morning Tommy stood on Addison in jean shorts and a white t-shirt, making himself visible to prospective customers—though lately most found him through the parking website a neighborhood kid had set up. Tommy gave business cards with his cell phone number and the website’s URL to all customers for future reference. Occasionally, women have called his cell after a night game asking him to walk them through the alley to their car, which he has been happy to do. As we walked through the alley that morning, at one point he stopped to move a trash can over the broken glass of a smashed beer bottle. Business to that point in the season had been okay for him, but, like everyone I spoke to, he remembered better times. We came to a stopped SUV blocking the alley. “Hey man, you can’t block the alley,” Tommy said. After a game has ended and all the cars have cleared out, as a courtesy to his neighbors Tommy will go through the alley and close their garage doors. His one-man system was in contrast to other alley entrepreneurs I observed and spoke to. Brian, who also parks an alley a few blocks west of the stadium, said for their setup several neighbors would go stand out near Addison. Since they did not use a website or any of the parking apps, business was contingent on these vehicles passing by, along with some regulars. The day I spoke with Brian he was posted at the entrance to the alley, directing the cars in, while a woman on a Xootr rode alongside to show them in which garage to park. Brian had been at this for fifteen years. It started when he was a kid, parking two cars in his parents’ garage. Before that, he remembered it was a man named Frank, whose daughter-in-law was out there now. People still came to the area looking for Frank. He would put air in their tires and wash their windows. He actually had to retire from the parking business due to a shoulder injury he sustained from the washing motion. The parking culture has provided some an opportunity to stay connected to their community, and to each other. If Wrigley Field has to this point mostly failed to exist in the present tense, the neighborhood that surrounds it can, at times, feel too preoccupied with it. With every new Cubs season there are restaurants, bars and businesses in Wrigleyville gone that you remembered just being there, and ones that are there which you aren’t sure if they had been before. As for its residents, Tommy lamented that only a handful of families remain in the neighborhood from when he was growing up. He said nobody who lives here is from here anymore, but also that the new people coming in were good people. For Ivy, who now lives in Skokie, she cherished the broad mix of fans she would park, and chat up, each night. She pointed out to me the diverse license plates in her lot just that evening: Florida, Kentucky, Colorado and Ohio. Also, as we stood talking, a car with two fair-skinned women pulled in. They were visiting from Germany. They had always wanted to go to Wrigley Field. 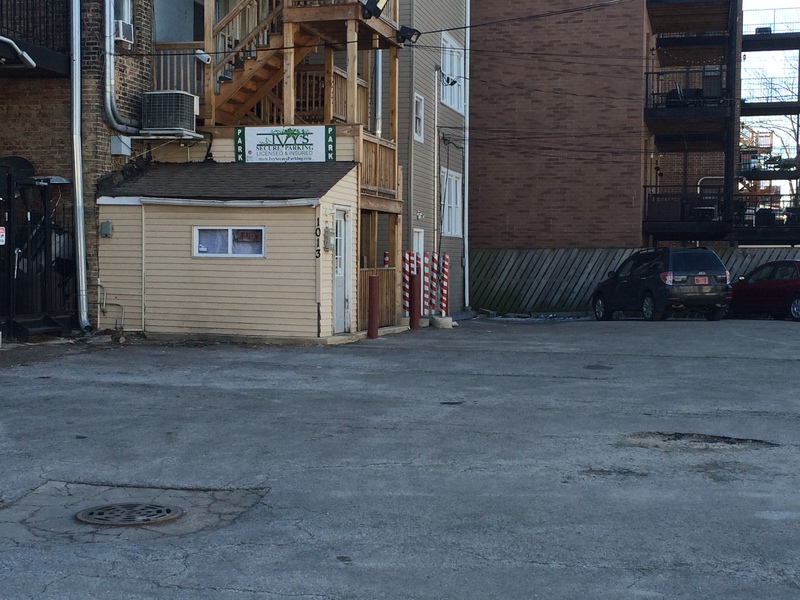 As I stood there in her lot, for a moment I thought I could hear Mendoza’s voice coming from across the alley, calling out to a driver on Newport that he had spots available for tonight’s game. Then the oncoming rush of the Brown Line obliterated everything. Already there had been whispers in the lots around Wrigley about the proposed Brown Line flyover, a $320 million CTA plan to raze as many as sixteen area buildings near the Clark Junction, north of Belmont, to create a curved bypass track for the Brown Line, limiting delays and easing congestion in what is one of the busiest areas of the El. If this were to go through, paired with the 1060 Project, it would mean almost a billion dollars of investments in a roughly one-square-mile area in a relatively short period of time. And like the 1060 Project, not without its detractors. A young man carrying a petition against the proposed construction had stopped by one of the lots I had been at earlier. He solicited our support, though his protest seemed to be mostly a symbolic one; he conceded eminent domain would win out should the CTA choose that route. Overhead the Brown Line had since rumbled by on its way west to Southport. I listened again for Mendoza’s voice coming from the other side of the alley, but all I could hear now was the steady whir of traffic in the city.